I was at the Pink Palace Museum with a group of 6 year olds for a Daisies field trip when I found out. I stood there. Stunned. I wanted to scream. Run. Jump up and down. Cry. But all I could really do was stand there and go through the motions, heart beating out of my body, looking at decorations on Christmas Trees and pretending to be mentally present. I’d just found out I been chosen in the Western States lottery. I’d done my first 100 miler in August and had qualified to enter the lottery. Fact is, I entered as casually could be, glass of wine in hand, with no hope of getting in. After all, I had something like a 7% chance of being chosen. Come to find out, I was the only person from Tennessee chosen in the lottery. No pressure there. So, I started reading. And obsessing. And running like Forrest Gump. I decided that I was, without a doubt, going to be the little fish in the big pond and the best I could do was train like crazy. In the months after I got ‘the news’ I ran 2 trail marathons, 4 – 50k’s, and 3 – 50 milers in addition to all the countless training miles on local trails. I ran in fear. Fear of failure to be honest. Lots of people now knew that this little-known blonde chick had gotten in and I am pretty sure there were several that not only didn’t think I deserved it but didn’t think I’d finish. And that, whether true or not, was gas on the training fire. I just really couldn’t fail. It was finally time. Craig (husband and crew chief extraordinaire) and I got to Sacramento on the Wednesday before the race and picked up my pacer, Erno, on Thursday morning. I’d pretty much wrapped my mind around the whole thing until we drove into Squaw Valley ski resort and I saw it – the mountain. It was the first 4 miles…all straight up a ski mountain. Deep breath!! We had the rest of that day and all of the next day to get ready – drop bags, medical check, crew maps, etc. The details made my head swim. 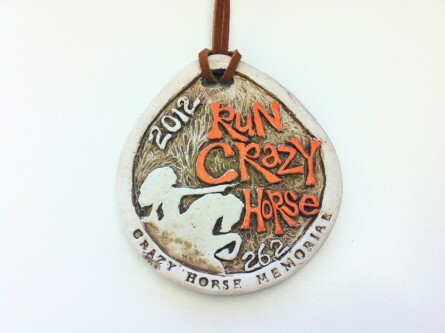 The ski village was filled with runners, many of whom grace the pages of Trailrunner every month. Some of them I recognized, and some of them Erno pointed out to me. I just kept thinking….breathe! After a surprisingly good (but short) night’s sleep, I got up on race morning at 3:45 AM and picked up my timing chip and race number, ate breakfast, got dressed, and kept trying to just breathe. It was finally time. I’d heard the weather was going to be cooler, which was great. Cool weather is historically rare for the Western States 100. I really didn’t pack for cool weather but was fortunate that Erno suggested I buy something to block the wind. Why did I choose a vest instead of a jacket?? I’d ask that question soon. The race started. Slowly everyone started up the mountain. Everyone besides the elites and fools were walking. The further up the mountain we got, it got cold and windy. By the time I was almost to the top it was incredibly cloudy, crazy windy, and starting to rain. And what was that hitting me in the face? Oh yeah, that was sleet. So, on I go…up, up, up. Rain, sleet, wind, cold. I couldn’t feel my fingers, I couldn’t get warm, my hat kept blowing off, and I was peeing every 2 miles. Geesh. I like running in the cold and the rain is something I even look forward to. But, I’m usually dressed for it and prepared. I just wasn’t. 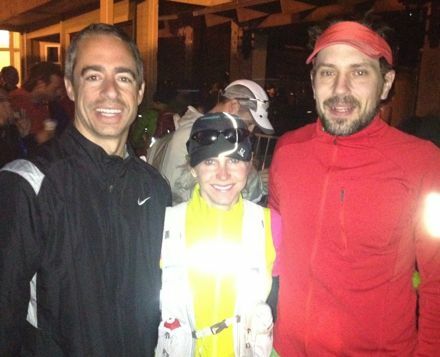 By the time I got to the mile 23 aid station and saw Craig and Erno, I had that look. The ‘OMG, what just happed to me’ look. They told me I looked great but I knew it was a lie. It’s that same look your sister gives you when she knows it was a bad haircut. The trying-to-hide-panic look. I was hitting checkpoints at the 30-hour cutoff pace, which was fine with me. All I wanted was to finish. So, I let them change my socks and give me a pep-talk and I went on. Admittedly it got better. The sun even came out eventually and the feeling in my fingers came back. Maybe I took it too easy. By the time I got to Devil’s Thumb I was 20 minutes behind the 30 hour pace. I knew it was starting to get dark and I could pick up my pacer at the next aid station. Turns out I made up the 20 minutes I’d lost by the time I got to Michigan Bluff. Craig and Erno were going nuts. I think they were surprised I’d made up the time. We did a quick NASCAR-style tune up with a sock change and a new shirt and we started running again. Erno was on a mission. And I trusted him completely. I was tired. I’d already been running for 19 hours. Off we went. 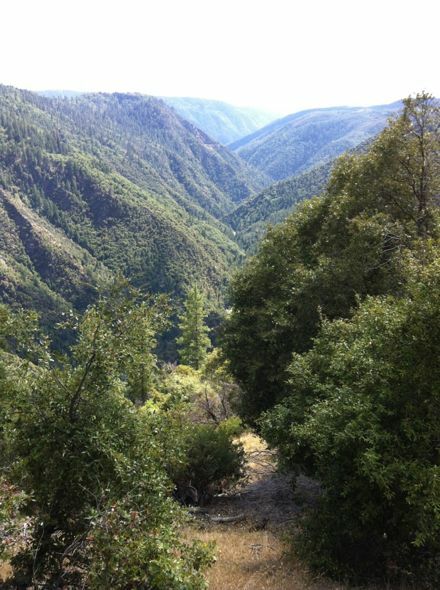 I honestly don’t remember a lot about the details for a few hours after that except that the trails were wonderful. The rocks were gone. There was a lot of runnable downhill. And I didn’t have to think as much since I now had someone doing that for me. We seemed to run pretty well for the next few sections. Erno must have looked at his watch nonstop. Every 20 minutes he would make sure I was eating something or taking a gel. I was handed an S-cap…and mindlessly I’d pop the little white pill in my mouth and take a big drink. I did pretty much whatever he said. Being on cruise control was great. Running at night was great. We started passing lots of other runners, some of whom had seen better days. There were runners arguing with their pacer-spouses, pacers impatiently standing and waiting on their puking runners, and lone runners who’d had the misfortune of running all night alone. We passed them all. Erno’s enthusiasm over the conquests was entertaining and motivating. We started hunting headlamps, passing everyone we could find. The only thing that made us run faster than picking off other runners was the sound of something huge moving in the woods right next to us. “RUN,” he said. And I did!! By the time we got to the river crossing at mile 78, we were almost an hour ahead of the 30 hour pace. He’d been telling me that there was talk that the river would only be about thigh deep. No problem. I could do that. The only problem was that when we got there they told me it was more like chest deep. OH CRAP! At this point, after rain, cold, sleet, wind, rocks, and mountains what’s a little river crossing? We kept looking for Craig, who was supposed to be at the aid station but we had gotten there so much earlier than expected that he wasn’t there yet. We crossed the cold river holding onto a cable that was stretched from one side to the other. They’d dropped glowsticks on the bottom so you could see just a little of what was underneath….big rocks. When we got to the other side I was just freezing and wet. And then we saw Craig! He had gotten the text update that we had made it to Rucky Chucky and he was running down the hill to meet us. Craig and Erno thought I should change shoes and socks but I said I’d rather keep going. It was uphill for a couple miles after that so we eventually warmed up. Craig ran with us until we got to Green Gate and I stopped just long enough to get really cold again so we did another NASCAR pit stop and got back on the trail. The sun started to come up and we were still moving pretty well, all things considered, when I looked to my left and said, “hey, what kind of animals are those?” With an “oh crap she’s losing it” look he turns around and tells me in his Hungarian accent that there aren’t any animals. They were rocks! Oh, and the abandoned bus in the woods…well, that was a tree that had fallen. Momma needed some sleep. We got a good little laugh and I decided it was best not to question things I was seeing, at least not out loud. We got to the Hwy 49 Crossing, mile 93.5, and I was starting to say things like “I hurt like hell.” My quads had been tight for miles and they were starting to throb. It hurt to make contact with the ground. It was coming down to running to the next marker. I was still barely hanging on until I got almost to No Hands Bridge. At this point, with only 3 miles to go, I was like an overly tired toddler at Target. I wanted to quit. I wanted to sleep. I wanted to cut my legs off. I was done. Three miles. That doesn’t sounds like much….unless you consider that there was a punishing amount of uphill climb in that last few miles. I cursed the bastards that would put a hill there. Sadists. I wanted to cry. I would have if I thought it would help. Craig met us at Robie Point, a mile before the finish. I ran, walked, hobbled with husband on one side and my pacer on the other. They had been amazing. We had done it. We got to the Placer High School and entered the track. I’d made it. Half a lap around that thing seemed like an eternity. I felt every step. And not in a good way. I’ve only cried twice after a race. But I laid there with the sun in my face in the grassy center of that high school track and tears rolled down my face. I’m not sure if it was relief or exhaustion or pain. Maybe it was a combination…but I cried for a few minutes, eternally grateful for the opportunity I’d just had. 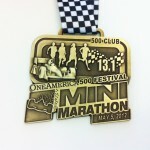 I finished in 28:45. I have to give special thanks to Craig and Erno. They were selfless, focused, and there for me in a way that humbles me beyond belief. Also, I have amazing family, friends and training buddies who believed in me and listened to me ramble and obsess for months over this race. Now it’s time to just breathe…until the next one. 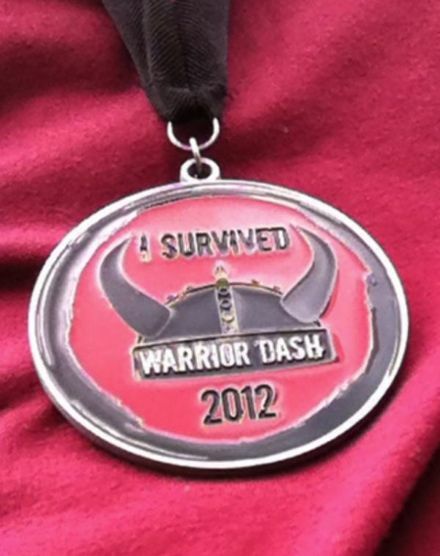 Here is the finisher’s medal from the Warrior Dash Arkansas that took place on May 12, 2012 in Amity, Arkansas. 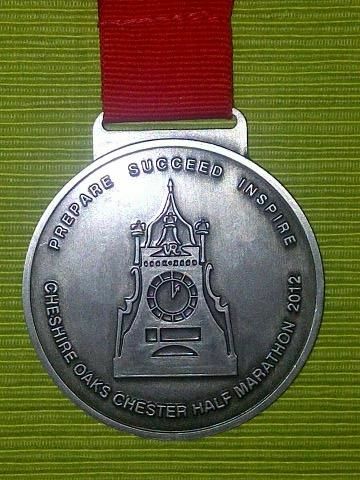 Here is the finisher’s medal from the Cheshire Oaks Chester Half Marathon that took place on May 13, 2012 in Chester, England (United Kingdom). 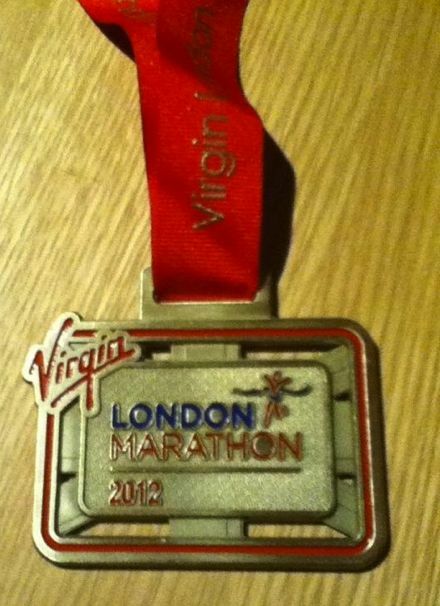 Here is the finisher’s medal from the Virgin London Marathon that took place on April 22, 2012 in London, England. 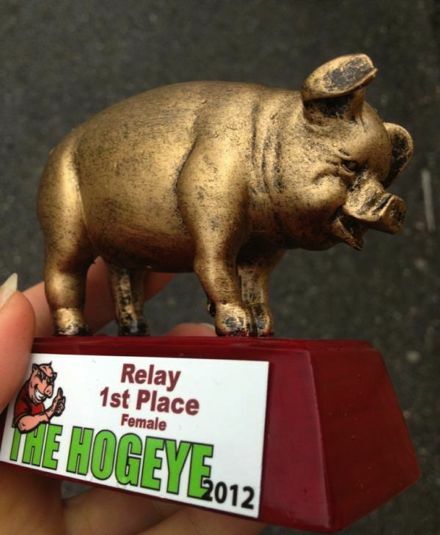 The 2012 Hogeye Marathon Relay took part this past weekend as part of the Hogeye Marathon in Fayetteville, Arkansas. 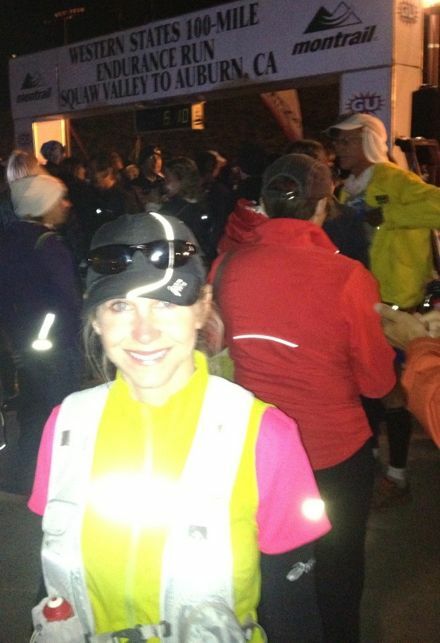 Leah Thorvilson, who was the overall winner of the marathon, also took part on the winning marathon relay team as well. Her winning team received very unique pig trophies as you can see above. 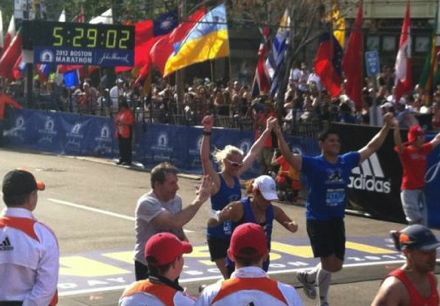 Former New England Patriots all-pro and current ESPN commentator Tedy Bruschi ran and finished the 2012 Boston Marathon on Monday. 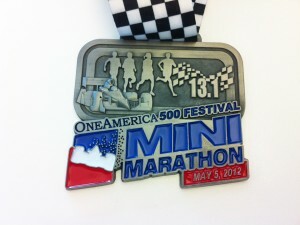 He completed the course, along with his wife Heidi Bruschi, with a finishing time of 5:26:02. Heidi beat out the old linebacker by a second (they ran it together) in 5:26:01. They hit the halfway point at 2:31:25. Tedy ran to raise money for stroke survivors. Bruschi suffered a mild stroke in 2005 just days after playing in the Pro Bowl. 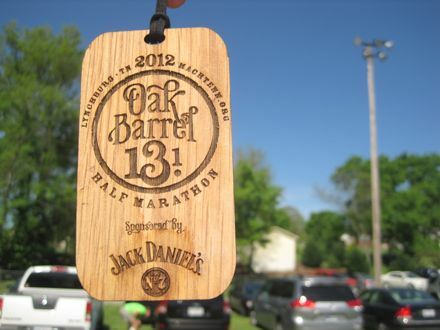 Tullahoma’s Brad Chronister won the Oak Barrel Half Marathon on April 7, 2012 in Lynchburg, Tennessee with a time of 1:13:00. Chronister was barely able to hold off Geno Phillips who finished just 18 seconds behind in 1:13:18. Third place went to Shane Thread in 1:19:30. The top overall female was Winchester’s Shanda Wells with a winning time of 1:33:02. Second place female went to Fran Glass in 1:33:32 with third place going to Misty Griffin in 1:34:28.